Home › Investing › Betterment Review 2019 – Up to 1 Year FREE! The first robo-advisors were introduced in 2008, but the concept didn’t really take off until 2010. That year, Entrepreneur Jon Stein unveiled a cutting-edge service named Betterment. Fast forward to today and Betterment is still at the top of most “best-of” lists, thanks to its comprehensive selection of features and its record of strong financial success. The company manages approximately about $15 billion in assets from hundreds of thousands of investors, and feedback from Betterment clients is overwhelmingly positive. Even industry analysts are nearly always impressed at the level of service available for the price. Like other robo-advisors, Betterment relies on a computer model and a team of investment managers to manage client funds. 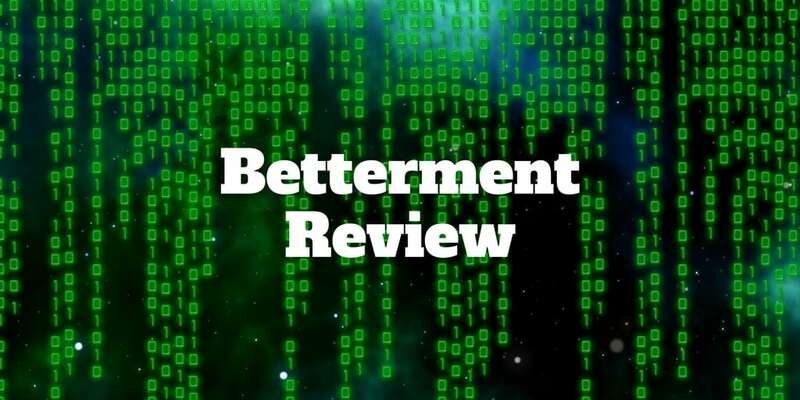 In this Betterment review, you will see how Betterment stands apart from its competitors and why it has been awarded a rare 5-star rating at Investormint. Are Betterment Portfolios Right For You? While most robo-advisors launch their services with purely digital advice, Betterment has expanded its product offering to include a wide variety of additional features, including tax-loss harvesting, socially responsible investing, goal-based investing, and cutting-edge financial tools and calculators. Although Betterment has been an industry leader for years, it strengthened its claim as the best robo-advisor when it added human financial experts to its already strong product offering. With so many bells and whistles, you might expect Betterment to charge hefty fees, but its pricing is highly competitive, ranging from 0.25% to 0.40% depending on what service level you choose. If you want access to human advice, you will pay more but if you want automated investment management only, the lower fee applies. If you make a deposit within 45 days, you can get up to one year of automated investment management free. You also get a free investment review to help you assess your current investment approach. Four areas are covered, including investment accounts, tax savings, fees, and risk exposure. Betterment initially offered just a pure robo-advisor service, now called Betterment Digital. More recently, Betterment has added Chartered Financial Professionals via its Betterment Premium offering, which has a higher minimum of $100,000, compared to no minimum for Betterment Digital. Fee-conscious, hands-off investors focused on the long-term will find Betterment portfolios to be a great fit. Unlike traditional financial advisors, who typically charge north of 1% annually, Betterment fees are just 0.25% for its purely automated offering, Betterment Digital. Customers who value support will find Betterment to be exemplary. Customer service is embedded in the DNA of Betterment. For example, CEO Jon Stein is known to answer customer phone calls from time to time, thereby setting the example across the firm that customer satisfaction is a top priority. 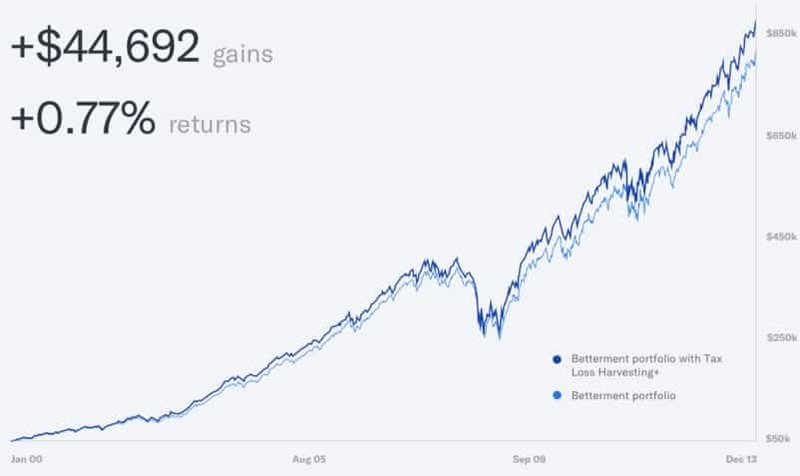 Betterment serves stock market beginners, savers and non-self-directed investors exceptionally well. The website is easy to use and jam-packed with education, financial tools, and retirement calculators. It’s easy to transfer funds, set financial goals to target retirement objectives and shorter term targets, such as buying a car, and even analyzing outside portfolios to gauge diversification and fee levels. For clients wishing to save and invest for retirement, but who are not keen on a self-directed approach, Betterment is the de facto standard other robo-advisors aspire to reach. Betterment doesn’t just serve growth-oriented investors who are a long way from retirement. It also offers a low-risk alternative to the Betterment portfolios that are designed for retirement investors, called the Blackrock Target Income Portfolio Strategy. The portfolio is made up 100% of bonds with a range of income targets designed to provide steady income with low risk. The interest earned from bonds is generally taxed as ordinary income, so it is best suited for a retirement portfolio that enjoys deferred tax breaks, like a Betterment IRA. 0.25% of assets under management for Betterment Digital, which is a purely automated advisory and tools service. 0.40% of assets under management for Betterment Premium, which provides account monitoring by a team of Chartered Financial Professionals and permits unlimited phone calls and email access. How good are Betterment returns? According to the robo-advisor, annual returns are 2.9% better than the average investor. Betterment Investing Review: The company’s investment philosophy has been influenced by Robert Shiller and Eugene Fama, both Nobel Prize winners. Betterment offers an automated investing solution designed to counter the risks associated with emotional investing, such as being greedy when markets are buoyant and selling in a panic when markets fall. Betterment portfolios are designed to generate optimal returns for each level of risk appetite by creating low-fee, diversified portfolios made up of exchange-traded funds from up to 12 asset classes. Proprietary algorithms are in place to automatically rebalance portfolios if certain positions start to drift and weigh more heavily on the overall portfolio. Betterment’s stand-out tool is its advanced retirement calculator, RetireGuide. Other valuable tools help you to understand if you are overpaying on fees in your 401k, and help you to invest unused cash. Betterment provides a retirement calculator called RetireGuide, which calculates how much you need for retirement and whether you are on track to hit your financial goals based on a series of questions you answer. Retirement goals can be applied to IRA, 401k, and taxable accounts. You can even link external accounts (e.g. bank savings account) to a Betterment Safety Net goal. RetireGuide is not a standalone service. Instead it is integrated to the Goals area so you and your spouse, for example, can project retirement income. If you are not sure how much you should be saving each year and what income you can earn from your savings, the RetireGuide calculator can give you insights on these questions and other common ones, such as how much you can afford to spend in your retirement years annually. The big idea is that spending and savings rates are compared to assess whether sufficient funds will be amassed by retirement to meet spending needs. By understanding how much you plan to spend each year in retirement and how much you will earn from social security and other supplemental income sources, a nest-egg estimate can be approximated. All you need to do is sync your existing bank and financial accounts, and Betterment figures out the rest. Another nice feature we found as we conducted our Betterment review was Smart Deposit. When you activate it, this tool automatically calculates how much excess cash you have in your bank account above a certain threshold and sweeps it into your Betterment accounts. 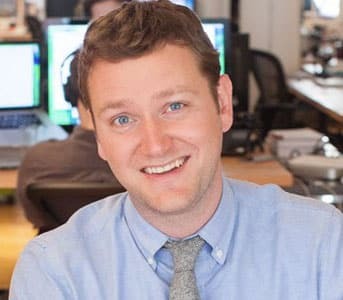 Betterment allows users to connect third-party accounts, including 401ks, analyze fee-savings and recommends portfolio optimizations. In our Betterment review, we found it easy to connect to outside accounts so portfolios held elsewhere can be analyzed to identify and improve upon expense ratios and performance returns. 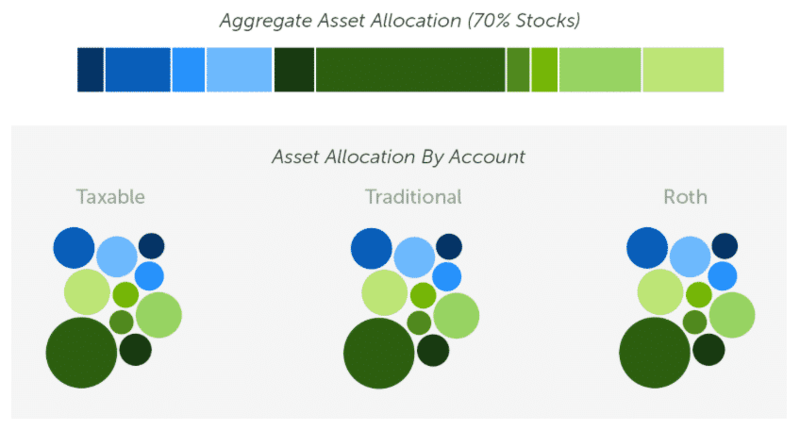 What separates Betterment from most robo-advisors is its external account analyzer. Now you will be alerted when high fees hit your account or you have excess idle cash sitting around. You will receive visual financial projections to see what your portfolio would look like if you rolled it over to Betterment. The bottom line is goal projections factor in external accounts too. Socially responsible Investing (Betterment SRI portfolios) is available to all Betterment customers to better align their investment dollars with their personal values. Is Betterment a good way to invest? Increasingly, customers demand robo-advisors invest their dollars in a way that is aligned with their philosophical beliefs. You may wish to avoid companies that have controversial histories, such as oil spills and data hacks. Global diversification, tax optimization and cost controls maintained while orienting investments towards environmental, social, and governance criteria. If your preferences differ from Betterment advice, you can choose Flexible Portfolios that provide you more control over how you allocate your capital to asset classes. Betterment Investing Review: Beyond socially responsible portfolios, Betterment now offers Flexible Portfolios to customers who want to exercise more control over their investing preferences. 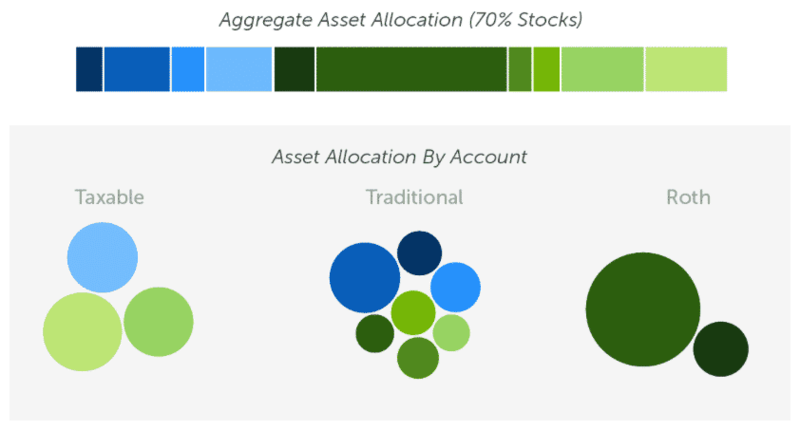 You can modify asset class weights within a Betterment portfolio strategy and receive real-time feedback about how those changes affect portfolio diversification and risk. All the standard benefits apply to Flexible Portfolios, including automatic rebalancing, Tax-loss Harvesting+, Tax Coordination+, and Tax Impact Preview. The one caveat is you will need to invest $100,000 or more to gain access to Betterment Flexible Portfolios. Betterment Tax Strategy: The goal of investing is to put more money in your pocket, and while focusing on gross stock market returns is good, paying attention to how much you get to keep after taxes is important too. To optimize for tax efficiency, Betterment uses two primary methods: tax-loss harvesting and tax-coordinated portfolios. Betterment allocates money between taxable and tax-advantaged accounts to optimize for tax consequences. When you have winners in your portfolio that you plan to sell, you can lower your tax bill by selling losers that count against those winners. This practice of counting losers against winners to minimize your tax impact is called tax-loss harvesting. But if you have sold two positions, is your portfolio still diversified? Maybe not! And that’s why Betterment replaces the sold security with a similar one to ensure that your asset allocation is optimized. Capital losses can lower your ordinary taxable income by up to $3,000 annually, creating significant savings over time. Betterment claims that tax-loss harvesting can generate surplus returns of as much as 0.77% annually. That may not seem like a lot, but over time it translates to an extra $44,692 in portfolio gains in a taxable account. How good is Betterment? Boosting after-tax returns in your taxable account via tax-loss harvesting is one thing but how do you minimize the impact of taxes across all your accounts, both retirement and taxable? That’s where tax-coordinated portfolios come into play. The idea in a nutshell is to put tax-inefficient assets into tax-efficient accounts and tax-efficient assets into tax-inefficient accounts. If that sounds like a brainteaser, here is the simple way of thinking about it. A municipal bond already enjoys tax advantages, so Betterment wouldn’t put it into a retirement account, such as an IRA, that already enjoys tax benefits. Instead, the municipal bonds would be placed into a regular taxable account that is less tax-efficient. Betterment claims tax-coordinated portfolios can boost portfolio value by as much 0.48% per year, which translates to as much as 15% over 30 years. Betterment has developed a series of rules called TaxMin that automatically apply when a security is sold. Most brokers use an approach called FIFO (first-in, first-out) that compares when securities are bought and sold but Betterment examines not only the timeline of purchases and sales, but also the cost basis too in order to lower the tax impact of stock or ETF sales. The idea is to exploit all taxable possibilities in one category before moving to the next. 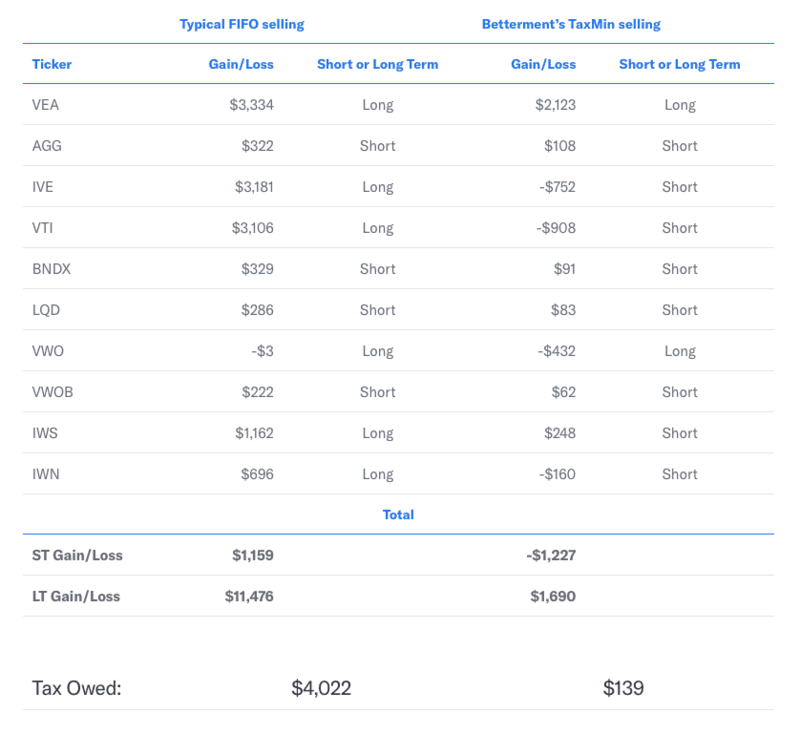 In the example below, Betterment saves a customer $3,883 by using its proprietary TaxMin algorithm versus applying traditional brokerage FIFO rules. If you already have tax loss harvesting turned on in your own account, you can apply it to your spouse’s account too so that your overall portfolios as a couple are managed holistically as one to optimize for taxes. Betterment has a demonstrated history of success attracting and retaining clients by offering low fees, superb customer support, access to Chartered Financial Professionals, and easy-to-use retirement tools. Although account minimums are high for more personalized service, the fees charged are highly competitive compared to traditional financial advisors. ✅ Low Fees: Low fees are the hallmark of Betterment. Its pure robo-advisor service, Betterment Digital, charges just 0.25% of assets under management. ❌ High Account Minimums for Higher Tier Services: $100,000 account minimum for Betterment Premium is a high hurdle for most clients, who on average have less than $50,0000 invested with Betterment. ✅ Premium Service Tier: Betterment Premium (0.40% charge for assets under management) connects clients with pre-screened Certified Financial Planners (CFPs) that provide financial advice. ❌ Direct Indexing: Direct Indexing allows investors to buy single securities held by an index and is beneficial in spotlighting tax-loss harvesting opportunities to minimize the tax impact on taxable accounts but Betterment doesn’t offer the direct indexing, unlike some of its rivals. ✅ No Account Minimum: For its purely digital service, no account minimum is imposed – you can open an account and check out Betterment at no cost. ❌ No 529 Plan Support: Betterment does not cater to 529 Plans nor 401k plans, though it will advise on them. ✅ Human Financial Experts: When it comes to human advice, Betterment is on the heels of Personal Capital by connecting clients to Chartered Financial Professionals, which is an especially valuable feature to higher net worth clients with complex tax situations. ✅ Customer Support: Betterment has fast email response times, and though its lowest tier offering does connect clients to support staff, financial advisors are not available for consultations. ✅ Retirement Calculator: Betterment’s retirement calculator, RetireGuide, is visually delightful, clearly showing projections, progress relative to goals, shortfalls, and recommendations to get back on track by retirement age and more. ✅ 401K Analyzer: Betterment facilitates easy linkage to outside accounts so non-Betterment portfolios can be analyzed to optimize for performance and improved expense ratios. ✅ Tax Loss Harvesting: Betterment distinguishes itself from traditional financial advisors by systematically finding embedded capital losses and optimizing for the tax impact. ✅ Tax Coordinated Portfolios: Tax-coordinated portfolio can potentially increase after tax returns by an average 0.48% annually for customers who hold Betterment taxable and qualified retirement accounts. ✅ Tax Loss Harvesting For Spouses: Betterment is able to optimize for tax efficiency not only across your individual accounts but also across your spouse’s accounts too. ✅ Socially Responsible Investing: You can align your investment dollars with your values and ethics by investing in Betterment SRI portfolios. Betterment Digital is designed to meet the needs of all sorts of investors, so there is no account minimum – a big advantage. The management fee is 0.25%, which is lower than or equal to the amount charged by competitors. Best of all, financial advisors are available through in-app messaging, so investors aren’t completely on their own. As a new customers enjoy promotional pricing on management services. For example, Betterment Premium regularly offers up to one year of free management with a qualifying deposit. Outside of promotional periods, Betterment Premium clients pay 0.40% for extra features, including unlimited phone access to certified financial planners. There are no annual fees, transfer fees, or closing fees with a Betterment account, which can make a big difference for small investors. While Betterment does most things quite well, there are a few areas of opportunity. If these are important to you, another provider might better fit your needs. First, Betterment does not offer a tool for direct indexing. On large accounts, direct indexing may offer substantial tax savings. Investors with taxable accounts have reduced ability to isolate opportunities for tax-loss harvesting when they work with Betterment. Next, some financial advisors disagree with Betterment’s strategy for investing funds intended to cover emergency expenses. They state that emergency funds should not be in an account that could lose principal, and they should be easy to access if needed. In addition, distributions from investment accounts may incur capital gains taxes, while withdrawals from standard savings accounts do not. Finally, some former clients have pointed out that moving their assets from Betterment to another firm is unnecessarily difficult. They indicate that the process is inconvenient and time-consuming. This could be an issue if you don’t intend to stick with the service long-term. Betterment has competitive fee charges compared to other robo-advisors and substantially lower fees than most traditional personal financial advisors. Betterment manages the following accounts and advises on accounts that it will not manage, such as 401ks. Betterment uses bank-level security and offers SIPC protection on each account up to the maximum $500,000. A new breed of investment tools has finally leveled the playing field. So-called “robo advisors” make it possible to automate your investment strategy, even if you don’t have millions in your account. At the top of the list stands Betterment, a top-rated robo-advisor service that offers high-quality financial tools and support at an affordable price. Betterment serves non-self-directed investors of all wealth levels who are fee-conscious and goal-oriented. In addition to its purely automated investment offering, Betterment Digital, Chartered Financial Professionals are available with higher account minimums for investors seeking more accessibility to experts. As a top tier roboadvisor, it has lots of tools to support analysis of retirement objectives and provides free syncing with non-Betterment accounts to identify lower fee funds and improved allocation opportunities. Plus, for customers looking for a little extra handholding, a nice feature Betterment provides is the ability to message licensed financial experts via the Betterment mobile app. Betterment earns high marks for its focus on tax efficiency through tax-loss harvesting, tax coordinated portfolios, and even optimizing for tax impact across spouse’s portfolios. The bottom line is if you want an automated investing solution that allows you to be hands-off and is jam-packed with portfolio-return-enhancing features and insightful tools all for a highly competitive cost, Betterment is very hard to beat.